I’m now on Facebook! Please follow the link below and like my page! Even if you’re not personally promoting it, your like will give your friends and their friends a chance to enjoy my books. Thanks! Read a Free Selection From My Book! Click the link above to view my book’s Amazon page! 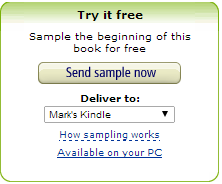 From there, click on the “Send Sample Now” button to get the early parts of my book for for free. Read the first step in protagonist Tom Manion’s nailbiting journey to the past to save our present! My first book “Time Possessed” is now available for the Kindle. You can go to the link http://www.amazon.com/-/e/B00E8OG9YA to find it. Let me know what you think.